Most homes are warm, cozy places we want to be. On a cold, snowy night with the wind whipping, the trees rattling, and the moon even hiding behind a cloud for warmth, we drag out out quilts, make a cup of hot chocolate, and settle in for our favorite movie. Because our homes are warm shelters from the elements, they not only attract us, but they also attract other critters, from spiders to mice and bigger. And these critters inherently know they should hide from us humans. And where do they like to hide? In our roofs, of course, far from our prying eyes and in a place we hardly ever go. Endeavor Exteriors in Denver is the best local roofing company. We specialize in not only roofs for homes, businesses, and offices, but also in siding installation, windows, and doors. We want to be your go-to for all your exterior home design needs. Below, we’ll review steps and measures you can take to rid your roof (humanely, of course) from critters. Contact us today! WHAT CRITTERS WANT TO CALL YOUR ROOF HOME TOO? Squirrels. Many people love squirrels. They feed squirrels in the park peanuts and seeds, and many people are patient enough to train squirrels to take nuts from their hands. Although cute and fuzzy, these little guys are rodents and leave behind waste like every other living organism does. These are by far the most common attic dwellers who will chew their way in, leaving damaged roofs behind. Frequently, you’ll have a mother squirrel decide your roof is the ideal and safest place to give birth to her babies in the spring. Squirrels are active during the day, and leave behind a scamper noise when running through your roof or attic space. Raccoons. These cute bandits love attics almost as much as squirrels do. Excellent climbers, insanely smart, and just as curious as cats, raccoons can create ways into your home if they want to. Mothers find your attic the perfect place to raise her babies as well; however, unlike squirrels, these guys are nocturnal — and heavy. You’ll hear heavier noises than a squirrel and are very vocal, especially with their young, so you may hear chattering, growling, and sounds of play coming from above. Rats and/or mice. Both rats and mice thrive in human environments with the plethora of food and cubbies to hide, making your roof a perfect place to make a home for life. They have lots of babies and are lightning quick, making the scampering noises rapid. They are more apt to be found in your ceiling, rather than your attic, where it’s much warmer. Bats. Bats love dark places to live and raise their young, making your attic the ideal home for them. Some bats migrate, but usually return to the same roosting spot (aka your attic) year after year. These furry mammals live a long time (in fact, pound for pound, they are the world’s longest living mammal), between 20 and 40 years. Bats are known for their silence, so odds are, you’ll never hear them — unless you have a large colony in your attic. However, bats leave greasy marks from their coat on the outside of your home at their entrance point. Opossum. This animal sparks many an affection. Like raccoons, they are excellent climbers but they possess opposable thumbs, making it very easy for them to gain access to your home. Again, blame the mama who wants a safe place to birth and raise her babies. Being slow (slower than raccoons), you might hear a slow, heavy walking noise from your roof, but are otherwise very quiet — to the point you might never ever know you have one living upstairs. Birds. Pigeons are the most common type of bird that loves your attic. These animals leave a ton of feces, so it’s imperative to remove them as soon as possible. Snakes. Snakes are rare in attics, so you can breathe again if you’re deathly afraid of snakes. Unlike the other critters, snakes are not seeking shelter — they are seeking food. This means you have an existing critter problem. Snakes smelled your critters (most likely your mice) for dinner, so in one sense, these guys are trying to help you with your critter problem the most natural way. Snakes are great climbers, and you may hear slithering noises in your ceiling. Block their entry point. 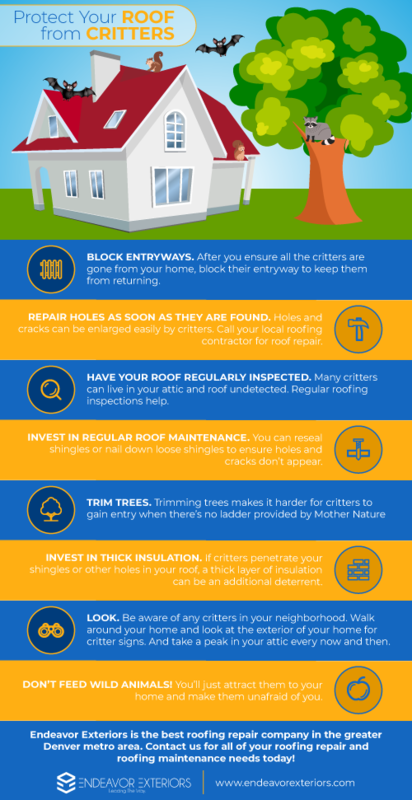 First, make sure you’re not locking in any critters, who will inevitably find a way out via more damage to your roof. However, by blocking their entry point, your critter may decide it’s time to find another home to abode in. In the case of squirrels, you can install a one-way squirrel exclusion door at the opening so squirrels can leave but not return. You’ll want to call in your local roofing company such as Endeavor Exteriors to inspect your roof afterwards and repair any damage (including repairing the entry point to it matches your roofing material). Then monitor this spot to make sure the culprit doesn’t change its mind after all. Traps. To deal with mice and/or rats, extermination is most likely the best strategy, albeit not the humane one. Although cute and cuddly, these little guys are causing lots of damage in and around your home, and they won’t ever voluntarily leave, like a raccoon will. You can use wooden snap traps or bait traps on your own, or you could call in an exterminator who will use a combination of methods to ensure these critters are all gone. Both trap methods can be used to either kill or trap these little guys alive. If you don’t want to kill your invading mice or rats, they can be trapped alive and relocated, which is best left to professional exterminators. Trapping is recommended most of the time for the larger animals, such as raccoons and opossums, where they can then be relocated. Make their home unpleasant. Noise and light. Two things most nocturnal, secretive creatures hate. By installing temporary flood lights and playing an annoying radio station, your uninvited nocturnal companions, such as the raccoon, will leave on its own. One -way doors work with raccoons as well — just be sure not to separate momma from her babies. Again, call in Endeavor Exteriors to inspect your roof, repair any damage, and seal off the entry point or points so your roof is perfect. Bats are a different problem. All bats are protected by law. If you suspect you have bats living in your home, you are required to call in a professional. Bats can be removed, but not killed. Exclusion methods will usually be chosen, which may involve nets or funnels, and then sealing the entry once all are out. Exclusion method. Birds leave a ton of feces, so it’s imperative to remove them as soon as possible, using the exclusion method. As we’ve mentioned, this option can be used for all of the critters above. Get rid of one problem to solve the other. Remove your mice and/or rats, and your snake will remove itself. You can also trap snakes, but you’ll still need to get rid of your small rodent problem. Insulation. Animal waste products cause immense damage. You’ll have to have all of the waste products from your critters removed as soon as possible by a professional. Waste products can grow mold and rot your wood. Animal waste products can carry infectious diseases that humans can catch. Unwanted hitchhikers, such as parasites, can be left behind. And like the snake, the scent of the animal is still in your attic and may attract other critters. You’ll most likely have to replace all of your insulation to be on the safe side. Ductwork and wiring. Rodents need to constantly gnaw and chew to keep their teeth in check. Wiring, wood, and ductwork are all fair game for all of the rodents above. Raccoon will rip into ductwork because they’re curious. Exposed wiring is a fire hazard, especially when surrounded by insulation. Water piping can be chewed as well, causing leaks that can cause immense damage. While cute and cuddly as most of these critters are, they are wild animals and not meant to be sharing living space with humans. Your home and roof are big investments that need to be protected not just from the environment, but also from what lives in the environment. Removing them from your roof and/or attic is doing both of you a favor. If you’re unsure how to DIY in terms or critter removal, call in a professional pest removal company to do the job for you. They most likely can clean up the mess as well. 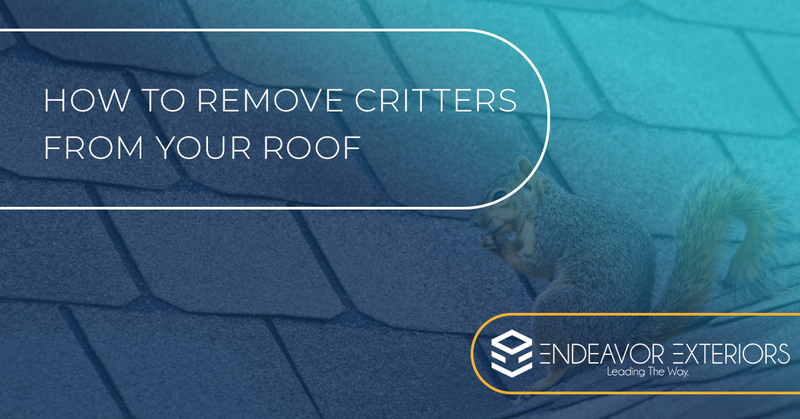 When you’re sure your critters are gone, call Endeavor Exteriors, serving both the Front Range and the greater Denver metro area, for roof repair and make your roof beautiful and structurally sound again. Endeavor Exteriors aims to make your roofing experience — whether a large job such as a commercial roof replacement or a small job, such as a patch to your eaves — as easy as possible. Our mission is to offer you the best roofing service and experience possible. We do this through our incredible roofing specialists who all collaborate from start to finish to make sure nothing falls through the cracks. We work with insurance agents for roofing claims as well as our financing partner to make sure you’re taken care of. We offer a lifetime material and labor guarantee, so if you’re not satisfied for any reason with your roof repair, roofing installation, or window and door installation, we’ll make it right. Endeavor Exteriors utilizes technology, so you are in the driver’s seat. With our app, you can visualize your home with different roofing colors and roofing styles, so you can take the guessing out of it. You’ll be able to see your siding options and pick and choose from the top manufacturers in Colorado. We’ll deliver complimentary samples to your door and consult with you for free. Then, we’ll provide you with a roofing or siding estimate based on your choices. There’s never any pressure to choose us over other roofing contractors. Endeavor Exteriors wants what is best for you. We want you to be absolutely dazzled by the exterior home services and roofing experience we provide. We do our best to exceed your expectations and make the actual work as non intrusive as possible in your life. We understand that a roof is a major installation, and we’ll work around your schedule to minimize impact to your home life or to your customers. At Endeavor Exteriors, your happiness is our reward, and your smile says it all. Contact us today for all of your residential, commercial, and multifamily roofing needs!